The Conservation of Arctic Flora and Fauna (CAFF) has recently undertaken a review of the abundance, status and distribution of natural wild goose populations in the northern hemisphere. The review suggests there are between 39.0 and 39.2 million wild geese in the northern hemisphere, belonging to 68 populations of 15 species. All but two populations number between 1000 and 10 million individuals: the exceptions being the Western Palearctic population of the Lesser White-fronted Goose (just over 100 individuals) and the mid-continent population of the Lesser Snow Goose (exceeds 10 million adults). ‘White’ geese (Chen: three species in six populations) are most numerous (17.2 million individuals) and all populations have increased in the last ten years. ‘Black’ geese (Branta: five species in 27 populations) number around 13.7 million individuals, with 19 populations showing a stable or increasing trend in the last ten years. ‘Grey’ geese (Anser: four species in 35 populations) number 8.1–8.4 million individuals, with 15 populations having declined in the last ten years. Results of the review will be published in a report comprising three parts: part 1 summarises the key findings from the study, and describes the methodology and analysis applied; part 2 contains the individual accounts for each of the 68 populations assessed; and part 3 provides the datasets compiled for the study which will be made accessible on the Arctic Biodiversity Data Service. Part one is currently available to download from CAFF’s website. The review incorporated data from many national monitoring programmes including the WWT/JNCC/SNH Goose & Swan Monitoring Programme. And it’s only thorough the support of these programmes and their networks, the majority of which are volunteers, that reviews such as this are possible. Reference: Fox, A.D. & J.O. Leafloor. (eds.) 2018. 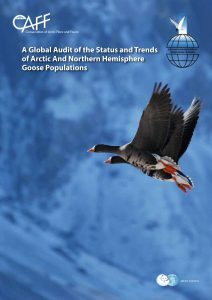 A global audit of the status and trends of Arctic and Northern Hemisphere goose populations. Conservation of Arctic Flora and Fauna International Secretariat: Akureyri, Iceland. ISBN 978-9935-431-66-0.